Celebrate these beautiful and amazing inhabitants of our world by checking out Lepidopterology.Com and get yourself some cool art & gifts featuring my BUTTERFLY POP ART at The PopArtDiva Gift Gallery! Butterflies cannot fly if their body temperature is less than 86 degrees.degrees. Butterflies don't have mouths, they have a proboscis - a long tube that works like a straw. Butterflies do not get bigger as they age - a young butterfly is a caterpillar. Antarctica is the only continent on which no Lepidoptera have been found. A caterpillar (baby butterfly or moth) grows to about 27,000 times it's original egg size. 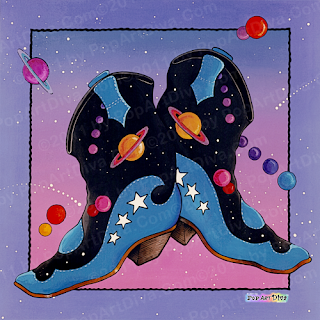 Electric Slide Boots is the fourth and final painting in my Pop Art Cowboy Boots series. These were actually a pair of cowboy boots I owned and wore, the only difference is I used white where my boots were black. The white pops more against the lavender - purple cosmic sky scape background so I took a little creative license with a favorite pair of shoes for the sake of art. The name comes from a western dance made popular during the Urban Cowboy era called the Electric Slide - still a popular dance in cowboy bars today. I always liked the music and thought the name was a perfect fit for this illustration. Like the other three paintings in this series (Midnight Cowboy Boots, All Dressed Up, Sunrise Sunset, Ya'll), Electric Slide Boots has a space inspired background - a recurring theme in my work over the years as a result of having been a sci-fi illustrator way back in my earlier illustration career. Painting alien skies, moon, stars & meteors is much more fun than painting ugly alien monsters as far as I'm concerned - I'll leave the monsters to Hollywood FX experts and teenage boys! When I started this painting I was thinking about cowboys tuckered out from riding the range, enjoying a final cup of Cookie's coffee and toasting their toes in front of the campfire under the canopy of the night sky. Nearby were their boots, well worn and broken in from lots of wear - bent at the toes and shaped into comfortable familiarity. Anyone who's a fan of cowboy boots knows that once you get your boots to that state of comfort there's nothing as easy on a hard working foot - not even a pricey pair of sneakers. 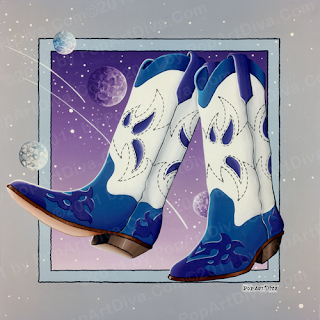 The title came from that visualization and the cosmic boot design was from my own desire to own a pair of cowboy boots with my favorite space theme. I never found a pair of boots like that and, short of custom ordering a pair, I probably won't ever own my own pair of Midnight Cowboy (or Cowgirl in this case) Boots but at least I got some inspiration from my wish. This is the third Cowboy Boot Pop Art in a series of four. The first two were posted the last two weeks and next Friday I'll post the last piece from the series so make sure to stop by.